The Blue-throated Macaw is a large parrot (85 centimetres). Plumage on its upper parts and long tail is turquoise. Its under parts are bright yellow. It has blue cheeks and throat patch (males have a darker blue throat patch), yellow eyes and a dark bill, surrounded by a bare patch of skin. When alarmed the Blue-throated Macaw produces a loud, raucous call. The breeding season is from November to March. The birds make their nests in the cavities of large trees. They feed on a variety of nuts, seeds and palm fruits. 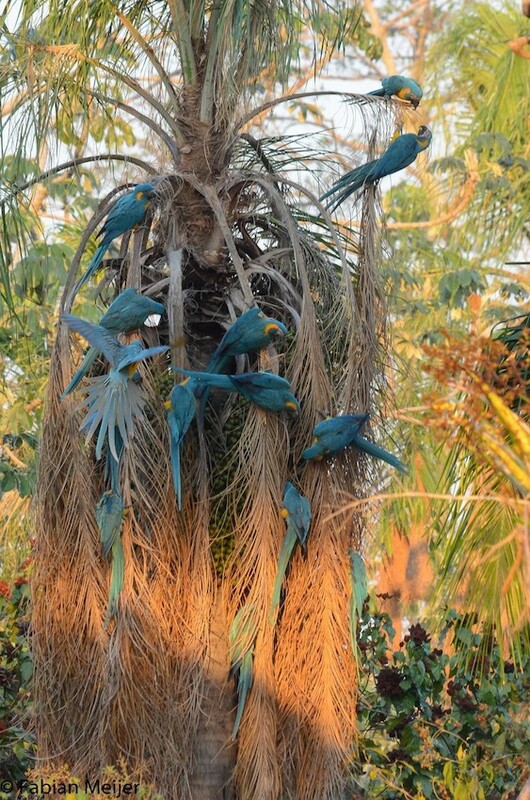 Blue-throated Macaws have a very restricted range and are endemic to Bolivia, predominantly the north of the country. The Blue-throated Macaw inhabits a mixture of palm groves, savanna and occasionally gallery forest. They are most commonly associated with the forest islands of Bolivia’s Beni savanna, where they feed on the fruit of the Motacu Palm (Attalea phalerata). One of the greatest threats facing the Blue-throated Macaw is the demand from collectors and the illegal pet trade. The species was thought to be extinct until rediscovery in 1992. Population size is estimated to number 250-300 individuals in the wild. Surviving populations are very fragmented and suffer from loss of habitat from established land management practices. The Blue-throated Macaw is protected by law in Bolivia and was declared a National Heritage species in 2015.